With well over half a million surfers now riding waves off our shores, British surfing culture is booming but what is it that has helped turn the tide? As an island nation cradled by thousands of miles of waved-lashed coastline one might have thought surfing would have long ago established itself as a UK institution, but two things prevented it from capturing the hearts of the populace: Britain’s freezing waters, and surfing’s unshakeable image as a slightly elitist all-male extreme activity. It is the easing of these barriers to entry that has finally help bridge the divide between surfing and the masses. The surf is no longer the domain of beach bums but has been embraced by much wider demographic prompting a leap in participation from between 30 to 40,000 people in 2000 to the well over 500,000 of today. There are now over 60 British Surfing Association-approved schools compared with 20 only ten years ago. But what has prompted the shoreline surge by a new demographic of thrill-seeking women, children, middle-aged men, urbanites and ‘surfing stockbrokers’? Of the new breed of surfers lined up on the beach it is the female contingent that has been most symbolic of a shift in attitude towards the sport. There are now an estimated 100,000 female surfers in the UK. When the country’s first stand-alone girls-only surf magazine, ‘SurfGirl’, was launched in 2005 it was hailed as a major benchmark in surfing’s rising popularity because it was a definite sign that the sport had broke free of its macho male exclusivity. Women had of course already long been active participants in surfing culture. ‘SurfGirl’ may have helped advertise their presence in the water but it is fashion that has played a major role in encouraging them to get in. Since Quicksilver introduced the first specialised surfing clothing for women in the late 1980s with its range of female boardshorts, the development of dedicated female surf wear has meant that women have been able to look fashionable on the beach while also adequately equipped to brave the waves themselves. Women may have helped dilute the popular image of the bleached blonde male surfer but ironically enough it is their growing participation that has been responsible for increased popularity amongst other males. More significantly, however, their infusion of glamour has also lent the activity a strong and lucrative commercial angle that has helped niche clothing manufacturers like Quicksilver, Hot Tuna, Billabong and Ripcurl evolve into mainstream leisure brands. The popularity of surfing brands on the high street with shoppers more interested the laidback cool they exude than on actually taking on the waves themselves has also proven to be excellent marketing for surfing’s reputation with the masses. Both directly and indirectly, women have certainly proven a powerful force in the growth of surfing UK but recent years has also seen the appearance of new faces on the boards unmoved by fashions or surfer girl presence. 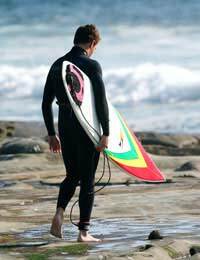 Older males have also been discovering the bracing thrill and cool appeal of riding the waves, whether they’re forty-something ex-surfers rediscovering their first love, or city workers looking for freedom and excitement away from the stressful confines of their day-to-day existence. The more practical advances in surfing fashions have also played significant role by removing the biggest barrier to surfing ever becoming a mainstream UK activity – the unwelcoming cold of British waters. Warmer and more flexible wetsuits have enabled surfers to brave the chillier waters in winter and autumn - when Britain’s beaches enjoy some of their best surf – and in doing so have effectively created a 12-month tourist season. Technological advances have also had an encouraging effect by keeping surfers better tuned in to what’s going on in the surf world. With the aid of dedicated websites, surfers can now monitor wind conditions and the height, frequency and direction of sea swells. They can also exchange useful information via web forums, emails and text-messaging with other surfers, actions which promote a supportive community atmosphere and ultimately foster a surfer that is better aware and more confident in their surfing environment. The benefits of the surfing boom are legion. A broad wave of active souls are able to get involved in a healthy and energetic activity in the nation’s natural environment, and in doing so provide a major boost to leisure and tourism - the industry is worth about £70 million to the Cornish economy alone - as well as the coffers of the global clothing megabrands. Nevertheless there is a minority of original enthusiasts that mourn the commercialisation and the mass public participation in their once rebellious and counter-cultural pursuit. Surfers were once a distinctive and fearless breed but now everyone looks like a surfer, and anyone can be a surfer.